The Amatis are the founding family of violinmaking. The dynasty spanned four generations, and Nicolò is considered the finest maker. Nicolò’s grandfather, Andrea (c. 1505-1577), is acknowledged as having created the form of the modern violin, viola, and cello. His father, Girolamo (c. 1561- 1630), further refined their models. Nicolò was trained by his father during an exciting time when Cremona had become the center of violinmaking in Europe, and a new musical aesthetic placed a high value on a soloist’s ability to express emotion and impress with technical virtuosity. It was also at this time that the string orchestra was developing. Around 1630, famine and plague devastated Cremona. Nicolò was the only member of his family, and the only leading violin maker, to survive. It took a decade of struggle before his shop was thriving again. With the loss of his family, Nicolò had to employ outsiders as assistants. It is due to this circumstance that he was able to keep the knowledge, technique, and artistry of the Cremonese tradition alive by training the next generation of makers, including the great Andrea Guarneri and Giacomo Gennaro. 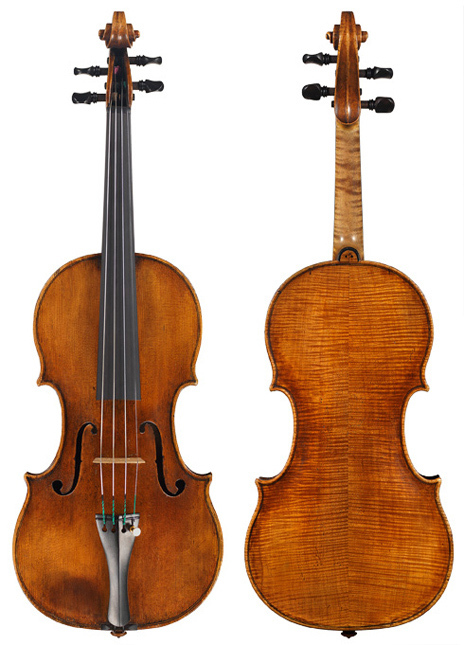 It has not been determined with certainty whether Antonio Stradivari, Giovanni Battista Rogeri, or Jacob Stainer worked in Nicolò’s atelier, but his influence can be seen in their work, a testament to his mastery as a maker and his significance in the history of violinmaking. Nicolò’s violins have been coveted by leading artists and collectors since they were made for their meticulous craftsmanship, elegant appearance, ease of response, and beautiful Cremonese tone, all qualities amply evident in this outstanding late-period example. It is our privilege to be the custodian of such a treasure, and we look forward to matching this stunning violin with its next caretaker.